We are excited to announce that our team has moved to a new location in North Aurora. We spent our previous years a few miles away from our new location — our old office served us well, and we made great memories there, but we couldn’t be more excited about our new space. The new office is not a retail storefront, however, allows us to store all the right equipment in order for the team to provide the best possible experience for our customers. The team will also conduct meetings and some training out of this facility. The picture above was taken at the new Hobson Plumbing and Heating location. We’re excited about the change. When we first moved into our last office, it left no room for any inventory or meeting space. The new office will offer more square footage, but more importantly, allows us to provide even better service. In our last office, we were working out of our busy home, as well as a heated and secure storage unit in North Aurora. While we really like our neighbors and the convenience, we live a pretty anonymous existence. There was no way for anyone in the community outside of our home to know we existed, and we’re hoping our new location will help bolster our visibility in the area and help us more quickly come to mind when local residents require a trusted plumbing or HVAC technician. North Aurora is where we have always called home for our business. We’re all huge advocates for this community, and we’re excited that our office location now furthers that commitment. Our location will have an easily accessible dropbox for payments if you prefer to hand deliver it. 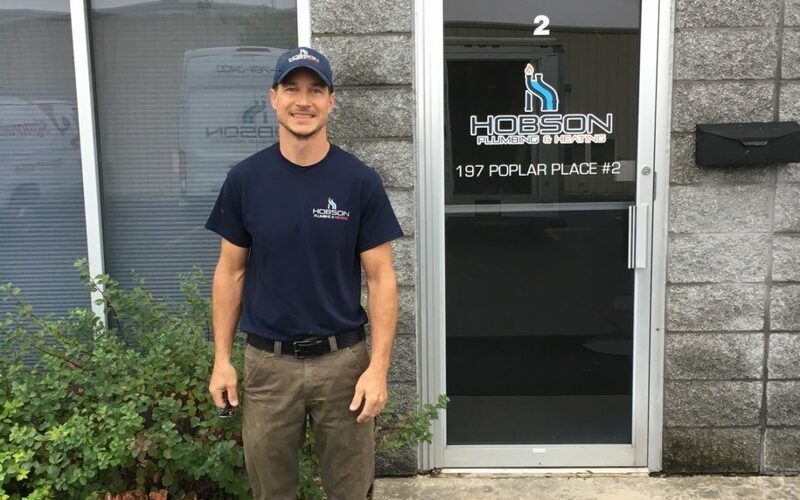 It has been an exciting two-plus years for Hobson Plumbing and Heating and we look at this new location as the start of another chapter in our history. We’re still working on getting settled in, but we’re incredibly excited to be in this new space. Thanks for everyone’s support throughout the years and with the move. Our new address is 197 Poplar Place #2 North Aurora, IL 60542.